Did I mention that I went to Europe this past winter? 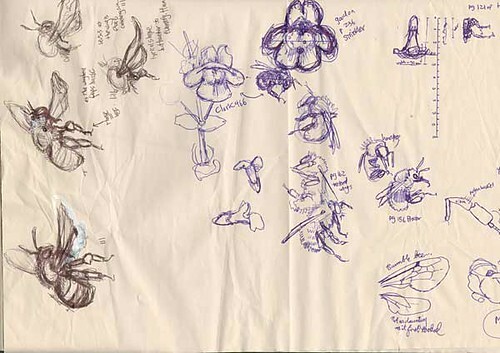 I've been itching to share the doodles that I did abroad, but on my return I've been so busy preparing for spring and summer events (the Wildflower Festival and the GNSI Annual Conference, respectively) that I haven't found as much time for blogging as I would have hoped. However, the very short visit that we had to the city of Prague had a nice impact on my Wildflower Festival work, so I'll start off with that story. February, 2011: Jack, Chris, and I have just spent almost a week visiting friends in Slovakia, and we stumble off of the train in the grand city of Prague, in the Czech Republic. 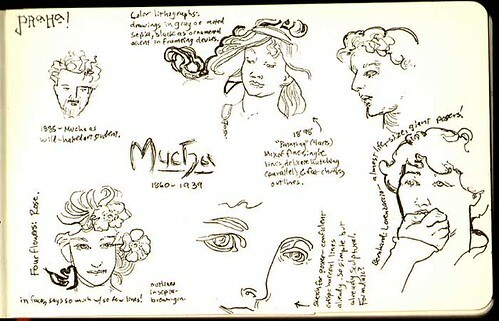 We only have about 4 hours before our flight leaves to the next stop, and I have one "official" destination in mind to compliment our general sight-seeing wander: The Mucha Museum. I've been a sucker for the art of Alphonse Mucha since I was a kid. I was worried that it would be less impressive in person, but man--it was way better. 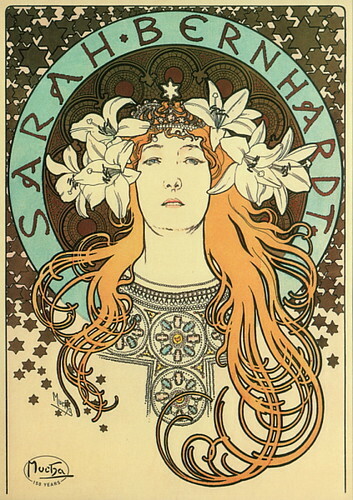 He worked very large, with his poster portraits of Sarah Bernhardt and other glamorous ladies being about life-size! Seeing the linework in his lithographs and sketches blew me away, too. The daring transitions from fine lines to huge thick ones, and the lovely sepia-tone inks, were just stunning in person. So when I returned to the States and found myself charged with designing the artwork for the Wildflower Festival poster, I was carrying all this Mucha excitement in my head. I didn't want to work exactly in his style, but I wanted to incorporate some of his magic somehow...And I found myself very drawn to his circular composition style (such as in this Sarah Berhardt poster). 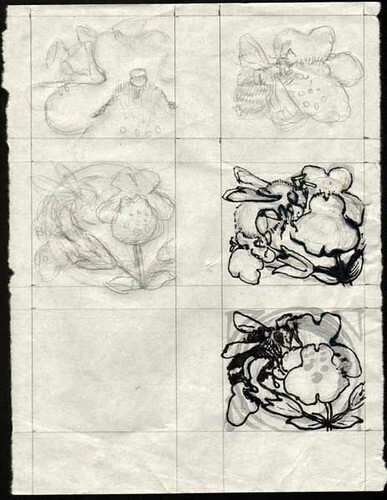 ...I also sketched bees & flowers in a Mucha-like frame of ornamental circles. So while the final poster doesn't look like a Mucha work, I nonetheless stared at his posters quite a bit when I was playing with the composition of all the pieces. I'll post a slideshow of all the digital layers of the poster soon, but here's a teaser of how it came out until then.